Located on E Highland Ave between Del Rosa Ave N and Sterling Ave just south of Foothill Fwy, Extra Space Storage serves San Bernardino residents near West Highlands, San Gorgonio, Perris Hills, Pacific, Nena, Del Rosa, and Belevedere. Locals will recognize our facility west of Highland Plaza Shopping Center. Extra Space Storage is about 2.9 miles from San Bernardino International Airport, making us a convenient option for San Bernardino residents who need secure storage while traveling outside of the area. 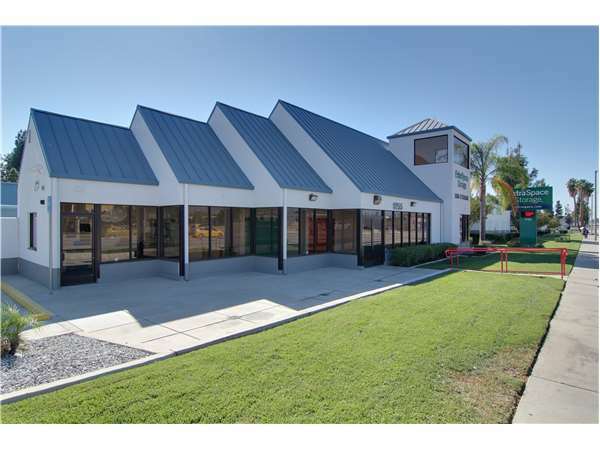 With a large selection of storage units, drive-up access and exceptional security, Extra Space Storage on E Highland Ave is the self storage solution you're looking for in San Bernardino. Our E Highland Ave storage facility has storage units as small as 5x5 and as large as 20x30. Units come with features like indoor access, first-floor access, and drive-up access to handle a variety of needs. For the ultimate self storage convenience, Extra Space Storage in San Bernardino offers drive-up access units, which allow you to pull a vehicle into or up next to your unit to unload and load without hassle. Units with drive-up access can also be used for storing cars, motorcycles, and some recreational vehicles. Drive-up units are available in sizes 10x10 to 20x30. At Extra Space Storage, we're dedicated to providing secure storage for our customers. That's why our E Highland Ave storage facility has 24-hour video surveillance, individually-alarmed units, and electronic gate access with personalized entry codes. Clean, well kept facility. Attendant was polite patient and helpful. Reasonable prices. I Absolutely love extra space storage from the prices, staff, to the well maintained facilities. I personally wouldn't rent anywhere else!! Extra Space Storage satisfied all of my needs. This location is extremely clean and very convenient. I have no regrets and would recommend this location to family and friends. Like I mentioned before, very helpful employee's, well lit & ventilated convenient easy to get to & from my unit. Answered all my questions professionally & without attitude. Highly recommend Extra Space Storage!!! If your looking for a facility with respectful and friendly people use Extraspace Storage. They know their business. I have used Extra Space off and on for years. They are conveniently located and always have the best rates and promotions. Elijah was extremely helpful he helped me select the proper size unit and offered suggestions on properly storing my household goods. The facility was very clean and no loitering at all. I am so happy I chose this location, I trust my items are safe here. They have great customer service. They were very helpful and were very nice. Overall they were patient and gave me what I was looking for. Will recommend this storage to my peers. On A main street so not in a populated area. So no worring about theft. Clean well maintained place. Customer serbice was great. Explained deatails in a respectable manner. Will def. Recommend to others. Great customer service, all my questions were answered promptly and options were reviewed in detail. Great service and very well maintained property. Will recommend to many others. The customer service and concern at this facility is excellent. The storage space was exactly what I wanted and needed. I wpuld recommend this facility. a pleasure having to keep my personal stuff safe, great staff, clean site, i would deffenately reccommend using this site for storage.
. This facility was the best place for us. Never a problem when we came to our storage unit. Customer Service was always professional and everyone are always so pleasant to talk to. They made you feel you had nothing to worry about.. and making payments was quick and easy. I would highly recommend this facility to everyone. Great Job Guys! THEY QUICKLY INFORMED ME WHEN THERE WAS A BRAKE IN AT THE FACILITY WHERE I HAVE MY STORAGE, AND THEY CHANGED MY LOCKS WITH NO CHARGED AND THAT RIGHT THERE MADE ME DECIDE TO STAY THERE I FEEL THEY WILL LOOK OUT FOR MY BEST INTEREST AND OTHERS AS WELL. She eased all my fears when she didn't have to and has excellent customer service! The employees are very helpful and thorough. They've answeres any questions I had and helped solve any issues I had.I'm very happy with the service that I receive here. Wow! This location is great! The manager showed me some different options and was very friendly. Also, MUCH cleaner than the competitor on the other side of highland. They give great service and they are very kind to me. Take the 215 Freeway South to 210 freeway East- get in the extreme right hand lane and get off on exit 78- Del Rosa Avenue– Stay in the right hand lane and make the right hand turn onto Del Rosa Avenue. You will want to move into the furthest left hand lane and drive about two and a half blocks passing various shopping centers. You will see a Walgreens on your left hand side on the corner of Del Rosa and Highland Ave. There is a Jack in the Box across the street. You will turn left on Highland passing the Jack in the box shopping center. You will then drive down about a block and a half. Passing the Highland Vet Clinic’s shopping center. We are on the right hand at 1755 E. Highland just before Sterling Avenue. Directions from the South: Take 215 Freeway North to 210 Freeway East- get in the extreme right hand lane and get off on exit 78- Del Rosa Avenue– Stay in the right hand lane and make the right hand turn onto Del Rosa Avenue. You will want to move into the furthest left hand lane and drive about two and a half blocks passing various shopping centers. You will see a Walgreens on your left hand side on the corner of Del Rosa and Highland Ave. There is a Jack in the Box across the street. You will turn left on Highland passing the Jack in the box shopping center. You will then drive down about a block and a half. Passing the Highland Vet Clinic’s shopping center. We are on the right hand at 1755 E. Highland Ave just before Sterling Avenue. Directions from the East: 10 freeway West to 215 Freeway South to 210 Freeway East - get in the extreme right hand lane and get off on exit 78- Del Rosa Avenue– Stay in the right hand lane and make the right hand turn onto Del Rosa Avenue. You will want to move into the furthest left hand lane and drive about two and a half blocks passing various shopping centers. You will see a Walgreens on your left hand side on the corner of Del Rosa and Highland Ave. There is a Jack in the Box across the street. You will turn left on Highland passing the Jack in the box shopping center. You will then drive down about a block and a half. Passing the Highland Vet Clinic’s shopping center. We are on the right hand at 1755 E. Highland Ave just before Sterling Avenue. Directions from the West: 10 Freeway East to 215 Freeway North- take to 210 Freeway East- get in the extreme right hand lane and get off on exit 78- Del Rosa Avenue– Stay in the right hand lane and make the right hand turn onto Del Rosa Avenue. You will want to move into the furthest left hand lane and drive about two and a half blocks passing various shopping centers. You will see a Walgreens on your left hand side on the corner of Del Rosa and Highland Ave. There is a Jack in the Box across the street. You will turn left on Highland passing the Jack in the box shopping center. You will then drive down about a block and a half. Passing the Highland Vet Clinic’s shopping center. We are on the right hand at 1755 E. Highland Ave just before Sterling Avenue.